A team from the USQ Open Access College (OAC) has been awarded funding under a Teaching Excellence scheme to create an open textbook. From the outset however we found that ‘textbook’ was actually a misnomer. Our creation, ‘Active Success at University’, is a series of discrete online learning objects, which can be used separately as stand alone learning activities, or connected via links. The materials are being designed to develop user confidence, self-efficacy, study knowledge and active engagement, all of which are key factors in successful university study. Didactic instruction will be minimised through design strategies, based upon gamification, that teach through encouraging active involvement, providing immediate feedback and a sense of progress. 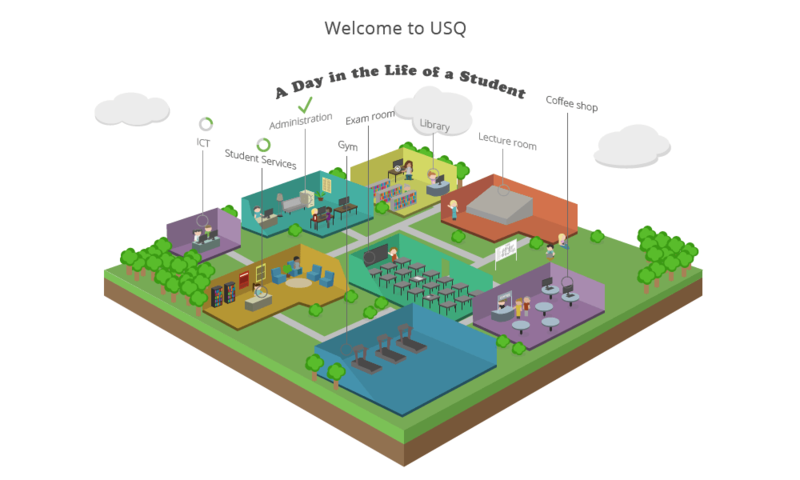 Illustrated below is a screen capture of one of the media resources, which is a live graphic allowing students to interact with the main support features of a typical university campus. The goal is not to create a large collection but instead to target particular important learning spaces, including academic writing, referencing, the daily experiences of students, stress and time management and the postgraduate study journey. A user’s guide will be included as well. The team is mindful of the ‘paradox’ at the heart of resources created for reusability, in that the less context is provided the more something can be used but the less truly useful it will be. To that end the choices of topics have been carefully made to provide optimal relevance and the user’s guide will suggest ways to integrate and adapt the resources. The coverage extends from pathways into both undergraduate and postgraduate study. The learning objects are works in progress, but through collaboration with learning and teaching services at USQ they are shaping up as exciting and innovative resources through the inclusion of multimedia and graphics, character avatars and with plans to include artwork. As work continues, we benefit from the advice of our critical friends from the University of Newcastle. Because of the nature of the project, the team’s commitment is to the open access of their resources. WordPress has been chosen as the platform for delivery. The team members are Kate Judith, Marcus Harmes, Charmaine Davis, Barbara Harmes, Anne Kerridge, Julie Penno, Heejin Chang, Lalanthi Chulika Seneviratne, Geoff Parkes and Jessamyne Clarke.